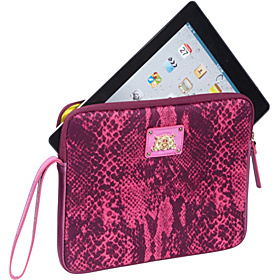 Protect your iPad in style with this Snake print case from Juicy Couture. The Juicy Couture La Python Snake iPad Wristlet – Neoprene is made from neoprene fabric and features an allover snake print with a Juicy Couture logo plate on the front, a contrast wristlet strap that makes it comfortable to carry, and a zip around closure that keeps your iPad secured inside. This iPad case is detailed with a contrast color interior lining and features a protective design that keeps your tablet safe from bumps, scratches, and day to day wear and tear. Carry this case on its own or slip it inside your handbag or tote bag for added protection when you’re on the go.